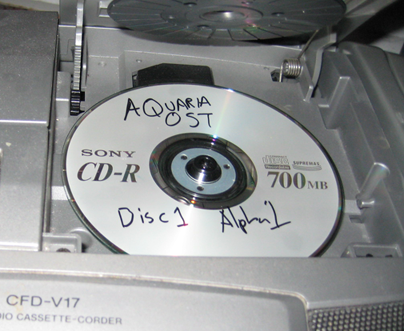 This entry was posted on Saturday, June 14th, 2008 at 9:24 am	and is filed under Aquaria, General Bit Blot News, Music. You can follow any responses to this entry through the RSS 2.0 feed. You can leave a response, or trackback from your own site. I’ve really enjoyed the music samples you’ve put on the site in past, so I’m definitely looking forward to the soundtrack. What sorts of instruments and software are you using? Awesome, I wondered how this was coming along. Is there ever a plan for an Aquaria Boxed Edition? Yay! I just recently installed the jukebox mod, and though it works great, I’d really love a CD so that I can take the music anywhere. I’m absolutely addicted to the sounds! 2 CD’s? You’ve gotta be crazy! If so, this will be definately one of my favourite music cd’s I’ll ever put my hands on! Great news ! Will you add the lyrics of the credits “Lost To The Waves” ? Could be great ! OH YES! This is I like, lots. LOTS. can’t wait my friend, your music is awesome! Once the OST is complete, will those who purchased the game get any sort of deal on it? Finally. News about the Soundtrack. Heck yes! Can’t wait. Highly anticipating this, the new patch, and a boxed edition. I want them all! please provide a more robust downloading process once this patch is live (or for your next game). I’m not even able to re-download the game from the link I received in my e-mail. I’m sure we can work it out if I ever lose my backup files but it’d still be better if the file was readily available, and if you also provided updated setup files that include the patches so that we don’t have to keep different files backed up for our game(s). I think you mentioned Plimus had the updated version(s) but as I said it doesn’t allow me to redownload it after so long anyway. Maybe you could add some sort of key based activation that turns a demo file available on all big gaming sites into the full game, a lot like Mount & Blade does (which as far as I know has managed more than decently enough against pirates with each subsequent version). That would make you able to just send the updated setup files to the file sharing websites and everyone could redownload the game whenever he needed to without adding to costs for you or the payments provider you have chosen. Also, you should put the patch files on the Aquaria page, not every player will check the blog or forums for it (please fans, let’s not hear any “if they can’t bother with the forums they don’t deserve the patch” kind of discussions). If the demo file is actually the full game then please just ignore my rant (but still let me know that’s the case so I can get it through there). If you want to reactivate your download, you can email admin@bit-blot.com and we’ll get you a new link ASAP. Keep in mind, version 1.1.0 isn’t out yet. Plimus just seems to be a bit backwards to me, with manually activating the downloads and stuff… I have no real complaints from the service since it worked out fine, if a bit slower than usual automatic systems, I’m just thinking you’d be better off also with something more modern? If it’s not too late, I wonder if you would consider editing all of the themes from the water areas of the game to flow from one to the other. So as one ended, the next would begin without pause and create a continuous piece of music, almost like a classical suite. I’m really looking forward to buying this! So how is this coming along? My girlfriend and I want it ASAP! Aye, I love the music to Aquaria… I also like the idea of making all the themes blend together and build into one another. I’d honestly buy TWO copies of the soundtrack, if one was a normal version and the other was the blended version ;). I love the music that much, haha. It’s one of the HUGE draws for games for me. If I can’t stand the music of a game, it’s unlikely I’ll play for long at all. Keep up the wonderful work! I enjoyed the game a lot, it reminded me the old amiga days with their 2D games. Excellent work dudes ! Is the Aquaria soundtrack available ? If yes, where to buy it ? Man, I don’t mean to come in after everyone’s long gone, but sheesh. I just beat Aquaria last night and the music’s been stuck in my head ever since. I’m trying desperately to remember every track I can while I’m here at work. From the wild, verdent tunes from the Kelp Forest to the dark, foreboding Abyss, I’m just crazy about these tunes. I’d really like this soundtrack so I can stop wracking my brain! Do you have any news about the Aquaria soundtrack ? Just wanna join to all the good words mentioned here. You guys really did a wonderful work! As for the soundtrack, pl keep us updated - I think, I’m not the only one who can’t wait to see the official release. And indeed, I am just at all times satisfied considering the exceptional pointers you serve. I’m usually to blogging and i actually recognize your content. The article has actually peaks my interest. I am going to bookmark your website and keep checking for new information. I would like to express my appreciation to you for rescuing me from such a scenario. After looking throughout the online world and getting proposals which were not productive, I believed my life was well over. Being alive minus the answers to the issues you’ve solved by means of your main article content is a crucial case, and the kind which could have negatively damaged my entire career if I had not come across your web site. That natural talent and kindness in taking care of all the pieces was invaluable. I am not sure what I would’ve done if I hadn’t encountered such a step like this. I can at this point relish my future. Thank you so much for your professional and effective help. I will not be reluctant to endorse your web site to any individual who wants and needs care on this area. Thanks so much for providing individuals with such a spectacular opportunity to read articles and blog posts from this web site. It is usually so brilliant and full of amusement for me and my office fellow workers to visit your website at minimum 3 times a week to read through the new guidance you have got. And lastly, I am just at all times pleased for the perfect techniques you serve. Selected 2 areas in this article are undeniably the most efficient we have had. Обратившись к опытному специалисту, вы убедитесь в том, что это достаточно сложный процесс, который начинается с настройки операционной системы, благодаря чему пользоваться ноутбуком будет намного проще, да и производительность значительно возрастет. Кроме того, мастер сможет очистить ваш ноутбук от лишних файлов и ненужных программ, настроить разрешение экрана, звук и громкость. В результате опытных и профессиональных действий Ваш ноутбук начнет работать без каких-либо сбоев, поражая своей скоростью работы и быстрым запуском операционной системы и приложений.